Many factors make the 2018 Toyota Tacoma a great truck for everyday tasks. For starters, it’s the right size for most jobs, and it’s easier to maneuver through tight spots. You’ll also find it provides plenty of performance where it counts, advanced technologies, and many comforts to make every drive enjoyable. If you’re on the hunt for a 2018 Toyota Tacoma for sale in Fort Collins and want a great deal, come to Pedersen Toyota. We have a wide selection of models, so you get the truck you’ve always wanted. 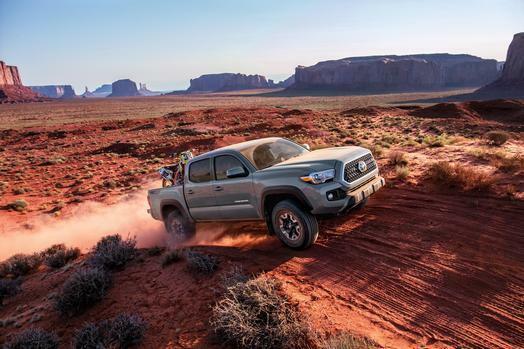 No matter which model you end up choosing, the Toyota Tacoma will take you to remote places with ease. It’s also great for towing and hauling, so you can work and play hard. You get to choose between two highly capable engines. The first, a 2.7-liter four-cylinder, puts in at your command 159 horsepower and 180 lb.-ft. of torque. If you need something even more powerful, the 3.5-liter V-6 with direct injection is the alternative. It uses the Atkinson cycle for solid efficiency, while still providing a stout 278 horsepower and 265 lb.-ft. of torque. Whether you need to tow or haul a big load, the high-strength steel used for the truck’s frame can handle it. With the Tow Package and the 3.5-liter V-6 engine, the truck can tow up to 6,800 pounds. That allows you to bring along a camper, boat, dirt bikes, or any other fun toys for a weekend getaway. The truck can also handle up to 1,440 pounds in the payload. When it comes to leaving the road behind, the Toyota Tacoma will act as a trusty companion. One especially helpful feature is the Crawl Control included on Toyota Tacoma TRD models. It automatically modulates the throttle and brakes at one of five available settings, so you can concentrate on traversing trail obstacles. You can also get Multi-Terrain Select on certain models. It has different surface settings, so you choose the one that fits the situation best, reducing wheelspin automatically. For even better traction in tough conditions, TRD Off-Road models use an electronically controlled locking rear differential. 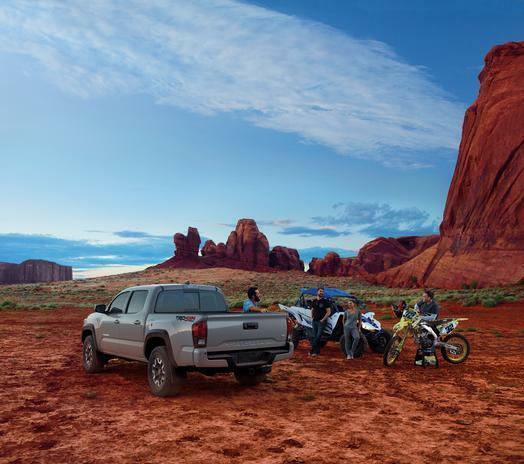 As you travel on roads or trails, the Toyota Tacoma has many designs that work to keep you safe. While passive safety features like a reinforced structure and airbags are included, other more advanced systems work to actively prevent accidents from happening at all. Trailer sway control helps you from getting in a bad situation when towing, simply by applying the brakes at individual wheels. The Toyota Safety Sense suite bundles together multiple technologies, like lane departure alert, pre-collision system, automatic high beams, and dynamic radar cruise control. Just like with other trucks, you’ll find the Toyota Tacoma has plenty of modern amenities to make any trip more pleasant. The truck also packs some unexpected features that you’ll find are quite practical. For one, the bed is made of a fiber-reinforced sheet-molded composite. It features a greater impact strength than steel, plus you won’t deal with rust spots in the bed. To that you can add a 120-volt covered power outlet in the bed wall. There are also in-bed storage compartments and a deck rail system available. Take the 2018 Toyota Tacoma for a test drive by contacting Pedersen Toyota.